In 1992 Angela Bassett took on the task to play the poised Katherine Jackson in the mega popular “The Jacksons: An American Dream” TV movie. We couldn’t have thought of anyone better for this role! Just a year later, Bassett took on the role of the legendary Tina Turner in “What’s Love Go to Do with It.” She hit the stage singing and sporting Tina’s classic trim and toned arms. She put on a heck of a performance. As the object of Maximillian’s desire, Rita quickly learns she’s part vampire in this comedic-thriller starting Angela Bassett and Eddie Murphy. In the mid ’90s there wasn’t a bigger African-American female anthem movie. “Waiting to Exhale” showed the lives of four African-American woman navigating love their romantic relationships. 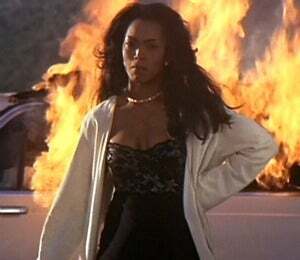 Angela Bassett played the fiery Bernadine Harris who’s famous scene leaves her soon-to-be ex-husband’s car in flames. Angela Bassett has a history of playing strong women — Katherine Jackson, Tina Turner and now Rosea Parks. In 2002 she took on the iconic role in a TV movie depicting the life of the Civil Rights legend. In a touching film about triumph, Angela Bassett played the role of Tanya in “Akeelha and the Bee.” Though Tanya may not have supported her child’s decision to end into various spelling competitions, she comes around by the end. Angela Bassett plays the uptight and cold mother of the bride in “Jumping the Broom.” Both sides of the soon-to-be bride and groom clash on Martha’s Vineyard putting the wedding in jeopardy. Be on the look for this exciting film on Mother’s Day weekend 2011.